The biggest challenge right now is being able to rear hatchlings and have them ready at just the right moment to coincide with the fry pond is perfectly cycled. It’s the most difficult aspect of our breeding process, and it’s what keeps me up at night. The status a week ago - top pond . this was cycled and filled with Sharkey hatchlings. 1 week on, and these hatchlings are growing nicely, and we are on course for a decent harvest in about 4 weeks. 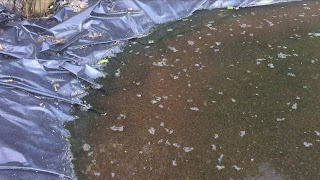 Then, last night, the strand algae in the top pond had got so bad that we both ended up in the pond for several hours last night extracting the stuff. We inevitably lost fish, but its about saving the masses... and clearing the pond so it continues to work well for the fry still there. The status a week ago - bottom pond . was part cycled, and I expected that to complete this weekend. But… it completed cycling earlier than I expected and I’ve had a tough decision to make in terms of what hatchlings to introduce. The showa hatchlings are still with us.. the numbers are not as high as I’d have liked, and probably not enough to fill a whole fry pond. Plus, they are not mature enough to introduce outside – and they have basically missed their window of opportunity to be grown on outside. So, last night – I started introducing our spare Sharkey hatchlings into the bottom pond outside. 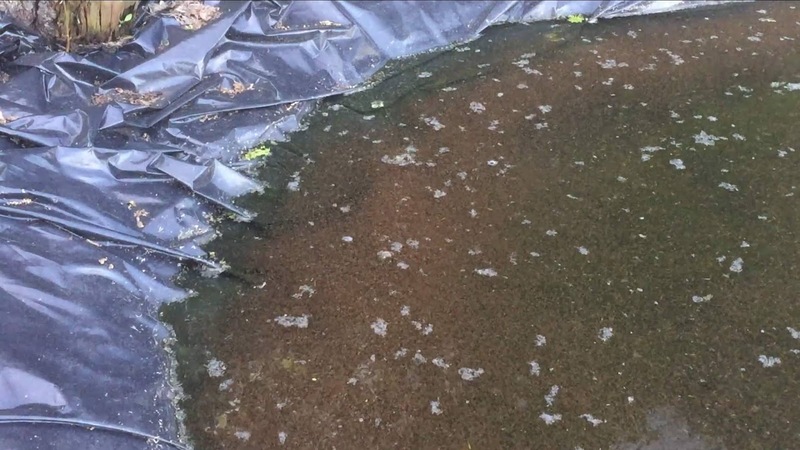 A risk factor this week is the temperatures have dropped considerably, and although the ponds is correctly cycled – there is a big risk that the low temperatures scuppers the whole thing. I’ll know in a week how it goes. Females still to spawn, are, ‘Lava Rosa’, ‘Marilyn’ and the Okawa female. On Lava Rosa… the best of her tosai (from 2017 spawning) are looking really good! I just wish we had more of them. The largest one is a whopping 41cm at 12 months old. I’ll post the tosai we’re growing on to nisai in a few weeks. We’ve made the selections, and taken pics and measurements. Just need to load them up.. But, right now.. we’re focussed on this year’s spawnings. When we run Lava Rosa later this summer, I’ll probably go with the Matsue males pair instead of the Dianichi males I used with her last year – to mix things up and try something new. For Marilyn.. she’s a new female and a bit old having never spawned before – so we will use the Dianichi males pair, who are tried and tested good spawners. The Okawa – I’ll wait until last moment before making my decisions…. Likely to be mid to late July.